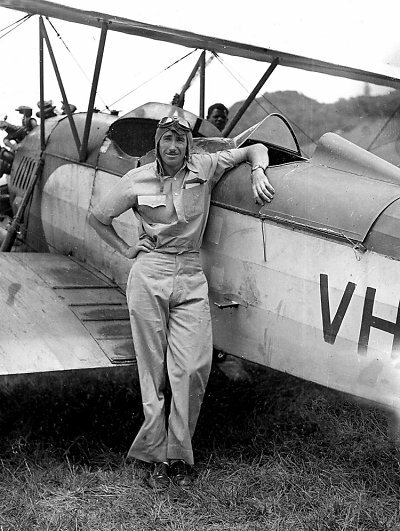 Neville Bruchhauser in New Guinea in 1936. Neville lived at Camden with his family. His father had a small property on the outskirts of Camden where he grew fruit. Neville's father bought him a Gipsy Moth (VH-UMS on 12 October 1933) for his first aeroplane . Neville wanted to have a commercial pilots licence but to fly commercial you needed a minimum of 100hrs flying time. To take non- paying passengers it was 25 hrs and paying passengers 50 hrs. In the meantime, he flew to small towns to take joy flights, thereby accumulating the hours he needed for his commercial licence and to make the money to pay back his father for the aeroplane. (The writer accompanied him on these trips to sell the joy flight tickets). He gained his commercial licence through Adastra Airways at Mascot, operated at the time by Bunny Hammond and Captain Frank Follett. The first job when he gained his commercial licence was with Adastra flying the Bega mail run in a de Havilland Fox Moth. He went from there to fly for De Havilland doing aerial photography work. Then he went to work for Bunny Hammond who had left Adastra to work for Holden's Aerial Transport Services in New Guinea. He became qualified to fly multi-engine aircraft, including Ford Tri-Motors. After leaving New Guinea, Neville came back to Australia and joined Adastra Airways. He flew the Dragonfly VH-AAD on photographic aerial surveys from Tamworth to Old Bar and up to Kempsey and Armidale during the war and the early post-war years. During one of his survey flights he helped in the search for the DC-3 VH-ANK "Lutana" which went missing on a flight from Brisbane to Sydney on 2 September 1948. After leaving Adastra he flew briefly for Trans Australia Airlines. He then went to Australian National Airways where he flew Viscounts until the advent of the Boeing 727. Neville decided not to fly jets and therefore retired from the company which, by then, had become Ansett-ANA. On his retirement, Neville Bruchhauser had over 30,000 flying hours. He lived in Sydney, North Shore area with his wife. He is now deceased. * Jim McKnight was a good friend of Neville Bruchhauser. This biography came to us via Lorraine Staniland (nee Laidlaw) who is Jim McKnight's granddaughter. J.N. Bruchhauser of "Elderslie", Camden, NSW was on a list of commercial pilots published on 30 June 1934. Subsequently he was a captain on DC-2s with Australian National Airways (ANA) and possibly with Airlines of Australia before that. He also flew DC-3s with ANA and retired from Ansett-ANA in 1967/68 as a captain on the Viscount.